Today every employee or consultant is a potential B2B buyer. The strategy to target the right person at the right time (and with the right proposition) gains therefore in complexity. However, with the new ” B2B pyramid of value” and the evolution in content marketing and social media, the B2B buyer decision-making process can be tailored for every stage of the funnel and role. Read on to see how to adapt your B2B corporate marketing strategy to this new trend. This article is part of Infunnel Marketing Automation Trend series. To get the latest updates, subscribe to our newsletter. Thanks for subscribing, welcome to the Infunnel community. B2B buyers are humans and what better way to define human needs than with the Maslow´s pyramid? This is why, to better understand the B2B buyer journey, researchers have organized “the 40 distinct kinds of value that B2B offerings provide customers” into a pyramid with five levels. Starting with the most objectives criteria (prices, compliance) up to reputational assurance and social responsibility. 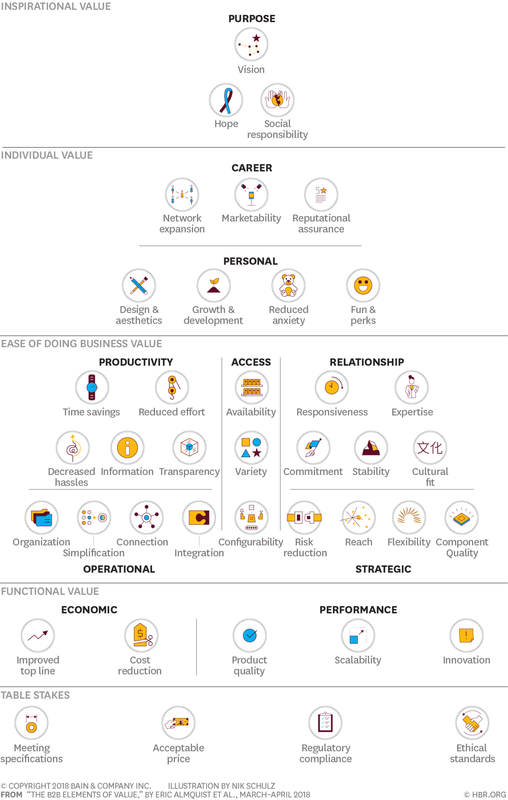 Harvard Business review published this very interesting “B2B Elements of Value Pyramid”. When browsing through this model, it becomes clear that B2B purchases are indeed based on table stakes criteria. And, this is only the tip of the iceberg. Much of the decision is also based on what the buyer will gain from bringing this purchase into the company, or what it will add to the brand in general. B2B purchases sometimes reflect the opportunities for the B2B buyer to improve reputation or increase influence within his or her organisation. Aspirational purchases are also gaining momentum when it comes to acquiring innovative products or technological services. The B2B buyer has little time to make the best informed decision. Therefore they want a transparent, clear and precise solution on their exact problem. This discovery journey then passes by reviews, social media, videos and information they can trust. The “wow” effect is always important but it’s better to be honest. The power of the customer voice is also becoming a reality in the B2B world. With more and more reviews either on forums, linkedin groups or by videos, companies cannot expect to “ hide” a poor customer experience through more marketing. That’s what Salesforce define as embracing the “power of the customer voice”. Being one of the few B2B which built a real love brand, it is relevant advice. Talking about videos, purchase managers watch videos all along their journey and especially when they want to compare products and gain more indepth knowledge: 48% of potential B2B buyers watch 30 minutes or more of B2B-related videos. Embrace the power of honest reviews: Listen, learn and adapt to reviews from online platforms, customer direct feedbacks or through social networks. There is a growing discontent against B2B sales reps from corporate buyers. Buyers do not always know how to ask or evaluate the technical details of what they have to buy and sales reps are sometimes underprepared to explain these technicalities. We all know the examples of B2B corporations that acquire a software that did not match needs or was meant for private use instead of corporate. This is why more often than expected major corporations reach out to consultants for advice on acquisition and implementation. According to Gallup, only 46% customers strongly agree that B2B deliver on their promises. 54% do not. Align marketing and sales team on your products value proposition and features. To reduce time searching and looking for peers´ advices: 75% of B2B buyers use social media to make purchasing decisions. Linkedin is getting more and more traction and the time when it was solely a platform for recruiters is far behind. Today, 85% of B2B buyers occasionally or frequently share business content on Linkedin. Since 2016 Microsoft acquisition, Linkedin has redefined itself and is now the leading platform for B2B leads generation. 2018 will only maintain this status. This should motivate marketers to test out the upcoming features starting with videos and reconsider the groups as Linkedin announced in October to renew its emphasis on them. Be present in online forums and groups: open the discussion to know your leads’ problems, before trying to sell your solution. Anyone can put their job at risk if they make the wrong (big) purchase. This is why B2B influencers could be the next big thing, however it is a trend to take with a pinch of salt as for B2C. Better talk about role models that buyers can relate to, that are either part of your own company or your key-customer that accept to be part of your customer success stories. This growth in Social media relevance for B2B purchase journeys is making companies look for B2B influencers. Forbes predicts 2018 could actually be the influencers’ golden year. Finally, to find the right distribution mix for social media: most B2B marketers prefer Linkedin over Facebook or Twitter despite its cost per lead. Twitter’s new changes and Facebook’s recent ups and downs make Linkedin a “safer” bet for this years social strategy. Every buyer rely on peer review: 67% consider it very important at consideration stage – Start by looking for someone from within your own organisation. While the B2C marketing is flooded with cute cats, GIFs and memes, B2B content is more focused on education and technical compliance. The B2B buying process now follows the purchasing manager process, in browsing the web before contacting a sales rep.
Half of the buyers will review 3 to 5 pieces of content before contacting any sales reps. This is what has changed in B2B: B2B content is now a key partner when buyers are trying to define their problem and what they actually are looking for. On Linkedin, The top-two words phrases for B2B content is “How to..” according to Buzzsumo analysis. The most relevant B2B pieces of content are White papers, case studies and webinars according to Demand Generation Report. Focus content on specific problem linked with your target industry and publish in the relevant formats (to know them better, consider implementing a DMP). Ensure to align marketing and sales team efforts. Large purchase decisions are complex and tiresome. On average between 3 to 5 persons from different departments and areas of expertise get involved in the purchase process. The number of people involved in B2B solutions purchases has climbed from an average of 5.4 in 2015 to 6.8 in 2017. Finally be prescriptive to reduce indecision and hassles: generate content adapted to each stakeholders expectations educating on your solution. “Prescriptive approach increases purchase ease by 86%”. Be prescriptive, not responsive: listen to your clients needs and present a solution. “Nurtured leads make 47% larger purchases than non-nurtured leads”. This means, after improving presence in social media and generating content into required formats, good personal relationships being digital or face to face improve results. As a B2B marketer, the responsibility is therefore to understand how to strategically distribute the content to each relevant stakeholder. C-suite executives are responsible for 64% of final decisions however the influence along the journey is more diffused. 81% of non-C-suite employees influence purchase decisions (Google). Finally, ensure to continuously explain your company’s commitment to solve their pain points. Another way to say it: This implies amplifying the marketing strategy to everyone as almost everyone is a potential B2B buyer. Do not only focus on Top managers, target everyone involved in your services: Top executives will mostly get involved at a later stage of the process and mainly for big purchases. The trend in B2B marketing is how the rise in digital marketing and more diffused buying role gave it more B2C characteristics. Purchasing responsibilities become a new way of positioning oneself in a company and also how to help improve the overall company branding. The impact it has on B2B marketing strategy means that strategy have to embrace aspects of B2C customers: build relationships and nurture your leads to help them seeing the direct value to them while also easing the buying process. A good example of B2B companies that have focused their marketing efforts first on training their users (and the individual value they get from it) like Hubspot or Salesforce. They succeeded to generate a lot of referrals and traction from the pride people are taking in being certified experts but at the same time having fun using them. Therefore, to attract B2B buyer, remember they are humans.